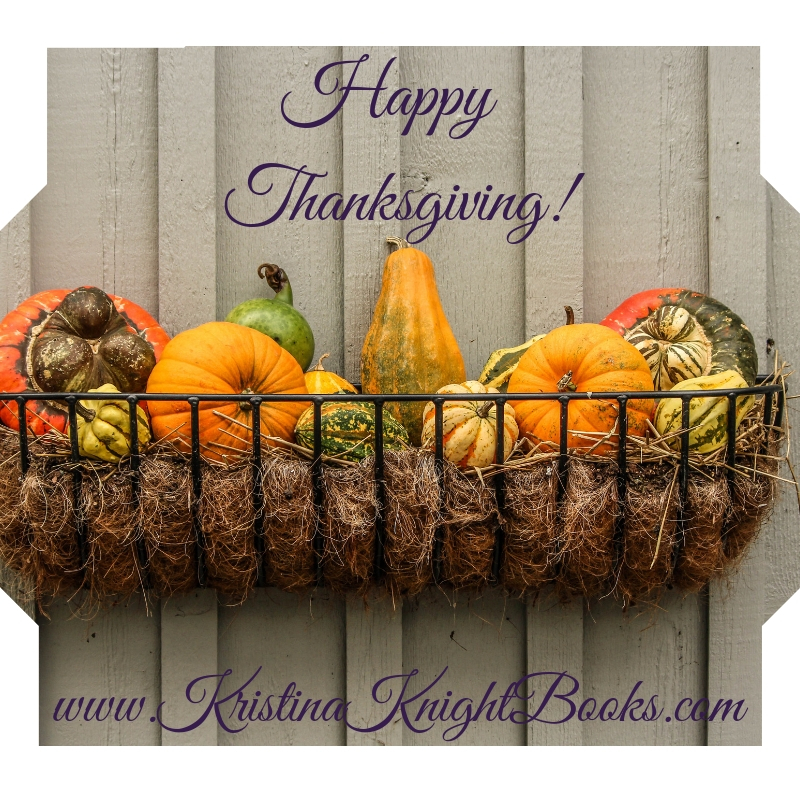 Hiya, readers! It’s been a while since my last post – and there’s a good reason for that! I’ve been on vacation – RadioMan and I skipped town for a cruise to celebration our anniversary. We didn’t even take bebe along – she got time with The Grandma’s (my mom came to town and RadioMan’s mom lives in our town), who spoiled her rotten. It was a lovely vacation: we cruised to Labadee, Puerto Rico, St. Maarten, and St. Kitts. Beautiful, beautiful islands, amazing people, and really, really good food. Oh, and books! I caught up on reading over the 9 days we were away. I read a Kristan Higgins book that’s been on my TBR for quite a while, an Elin Hilderbrand book, Caitlin Crews was in there, too. And don’t worry – lots of sun was also had! 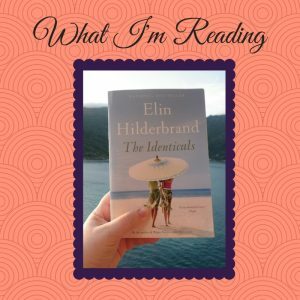 I’ll put up a couple more book recommendations later on, for today’s post, Elin Hilderbrand is up! The Identicals is a women’s fiction book, focused on estranged twins. What I love about Elin is her voice. She writes (primarily) about Nantucket, Martha’s Vineyard, and other islands around the Cape, and her voice brings those islands to life. I can almost smell the ocean breeze, can feel the sting of the hot sand on my feet, and this book was not a disappointment. I have to admit, I was rooting more for Harper throughout the book. Mostly because Tabitha was…a little too blam-ey for my liking. I don’t mean she was a bad character (she was really interesting), but she didn’t own any of her choices. Instead, she blamed others (mostly Harper) for the things she didn’t/couldn’t do or was afraid to do. Because of that, she’s in a toxic relationship with both their mother and Tabitha’s daughter..and most of all herself. The same can (almost) be said about Harper. She is her own worst enemy, like her sister, not because she blames other people but because she takes too much blame on to herself. Unlike Tabitha, though, Harper owns her choices and decisions…and, yes, they’re usually the wrong choices. Still, she’s a fun heroine to root for. If you’re looking for a fun vacation/summer read, consider picking this one up. And if you do, I hope you love it! Hi, readers! It’s release day for my book, Moonlight Match, part of the Resort to Romance Series, and I am so excited for it! 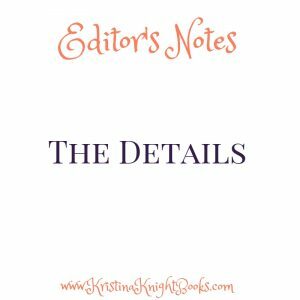 Last spring my friend, Jill Kemerer, asked me if I would be part of a multi-author continuity – all sweet romances, all set during a matchmaking week at a private island in the Bahamas. I couldn’t say no once she told me about the resort owners, Goldie and Ginny, and some of the shenanigans she’d already come up with, and I am so glad I decided to take part. Working with these authors has been a privilege and so much fun. And now the best part – the books releasing into the world! – is here! One book from the series releases each week from February 19 through May 7. You can pick up my book, Moonlight Match, for only 99¢ but only for a few more days…so head over to Amazon to pick up your copy today! Welcome to WEEK 4 of the 10 Weeks of Romance Giveaways! Ten of some of the best authors in the inspirational and sweet romance genres are hosting a 10 Weeks of Romance Giveaway to celebrate their new Resort to Romance series! 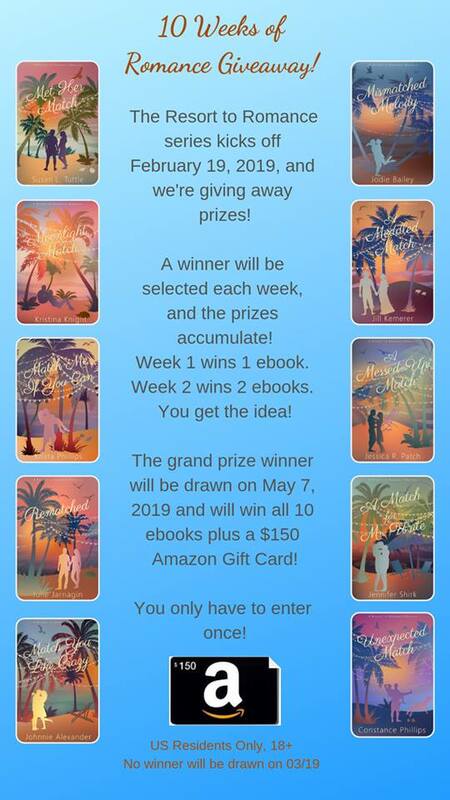 Each week beginning Tuesday, February 19th through the week of Tuesday, May 7th, a new book by a new author in the series will release, and you have the chance to win one, some, or the grand prize which includes all ten novellas plus a $150 Amazon gift card! Here’s how it works: Register at the rafflecopter below. We’ll randomly select a winner each Tuesday. And the great thing about this giveaway is the books build with every author’s new release! That means your entries roll over each week all the way up the grand prize. This week’s prize is my book, Moonlight Match! Some call Ethan Talbot rigid, but he prefers to think of himself as prepared. Unfortunately, when he’s matched with Aster Harrington at Joy Island’s Matchmaking Week, all those carefully prepared plans go out the window. He can get back to finding a suitable wife once he’s home in New York. After all, how much damage can one week in the Bahamas do to his plans? 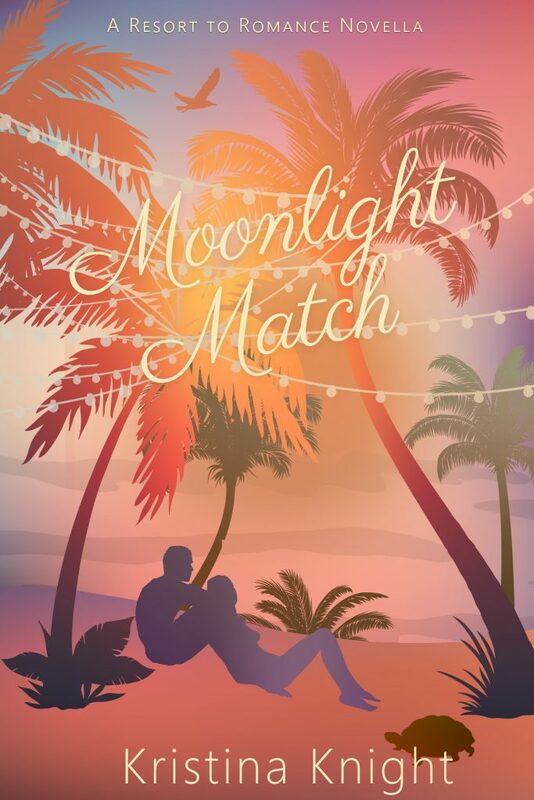 Buy Moonlight Match for only 99¢ for one week only! Be sure to stop by Constance Phillips’ blog next Tuesday to see what book is being added to the giveaway. Coming Soon: A New Multi-Author Series! Hey, readers! I have big news to share – some of you might have an idea because I’ve been hinting at it on social media for the past week: I’ve been asked to be part of a new multi-author continuity! For those of you who don’t know, a continuity is a series of books set in a similar place or within the same family or sometimes even the same town. In our case, this continuity uses the similar setting: all 10 books (yep, 10!) 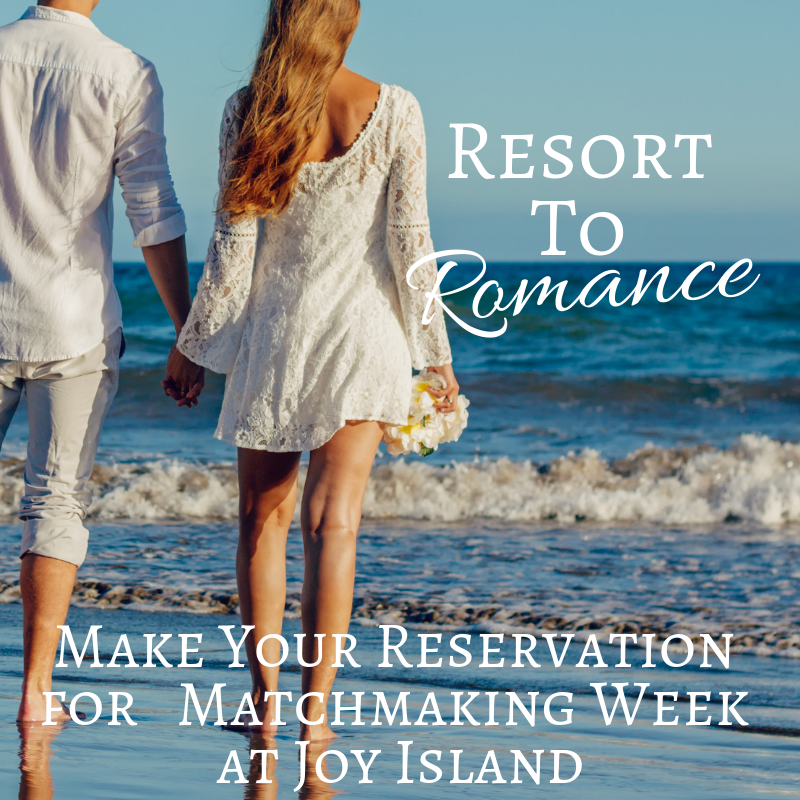 take place during Matchmaking Week at the fictional Joy Island in the Bahamas! How fun is that? It’s Matchmaking Week at an all-inclusive resort on a private island in the Bahamas. Each guest has been expertly paired and is here to enjoy one full week with their match. While there’s no money-back guarantee on the paid trip, the participants are guaranteed to find love! You can pre-order now by clicking the Amazon link above; this book will be exclusive to Amazon for the first 3 months. And, mark your calendars for February 19, 2019 when book one, A Meddled Match, hits retailers! I love Pinterest. Next to Instagram, its my favorite of the social networks because of all the pretty pictures. If you follow me at all on Pinterest you know I have boards for all kinds of things: favorite quotes, meals that I’ll probably never make, inspiration, and I even have pinboards for each of my books. My book pinboards are filled with nature pics and some quotes and (naturally) the models and actors that I think represent the characters in my books. 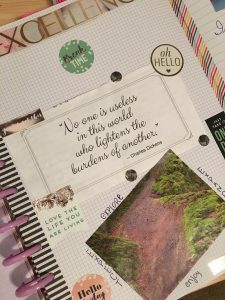 These pinboards are very much like vision boards for me, and while I create them in the beginning stages of each draft, I add to them throughout the writing and editing and publishing process. These pinboards help me keep my vision of the books fresh while I’m trudging through the middle (middles are HARD for me, people! ), and last year as I was setting up my planner I thought: why aren’t I making pinboards for other things? I should do that and so I did. I made a vision board for 2018 on Pinterest. It was beautiful. Filled with quotes I like, pictures of places I’d like to visit or that inspire me…you get the idea. The problem was that while I filled that board up quickly, I forgot to go and check in on it (which made for a fun surprise this year when I discovered in again…but I digress). I wanted a vision board for my year that would actually work to inspire me – that I could see every day and not forget about. That meant it needed to be a physical board, not a digital one. The big problem with creating a big poster or cork board sized vision board is the size of my office and the fact that it doubles as a guest room. I kept thinking and wondered if I could create a vision board that would live in my planner for the year. I use my planner daily, so I wouldn’t lose track of my vision. I could add to it throughout the year because I use the Happy Planner/discbound system, that was a bonus. I played around with that idea and it turns out, I could. And I did. And I am so excited about it! I wound up putting the vision board in my project planner because that’s what made the most sense. So far I’m really loving it. When I see those images I chose to represent my expectations and hopes and plans for the year, it just makes me happy and inspires me to keep moving forward. So much, that I wanted to share the process with you guys because I think it could help you, too! Here’s what you need: glue, a few blank pages that will fit into your planner, and clippings from various magazines or digitally printed. The images can be words that are inspiring to you, nature images, inspirational/aspirational sayings, and even people that inspire you if you’re so inclined. If you don’t have any magazines laying around, contact your local Goodwill – most have stacks and stacks of magazines that you can buy for $1/bag. Step One: go through the magazines page by page looking for images, headlines, and even bits of text that make you happy in some way. Cut them out and stack them in piles. I made piles of nature pics, some health/wellness images/words, inspirational words, and even a couple of pics of people (Oprah!) who inspire me. The number of clippings you have will vary, but I think a solid number is probably 20-30 clippings. Step Two: decide how many “sections” you want for this vision board. I used three sheets of planner paper, and “titled” each page according to what it represented. I have a page for work (writing), a page for home, and a page for health/wellness because those are my top three areas this year. Step Three: figure out which images you want on what pages and/or, if you’re just doing a single page, which section of the page. I like to have one big image and then I fill in the rest of the area with quotes and pictures that either reinforce what I see in that image or that build upon it. Once you’ve figured out what goes on that page, it’s time for Step Four: start gluing! Rubber cement or glue sticks work well, but I prefer a tape runner (I use a TomBow) because it isn’t as messy but it keeps things in position. For my vision board, I also used washi to tape the pages together so that they fold in on one another. Speaking of, washi would be a great way to stick images to your pages and add a little more color/texture to the overall piece. That’s it. You’ve created a vision for your year that can be tucked into your planner (or put on a cork board if you have one!) that will keep you inspired for the next year. 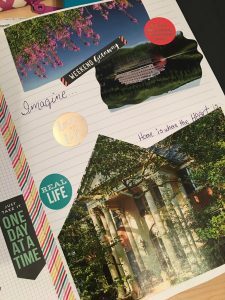 Do you like vision boards? 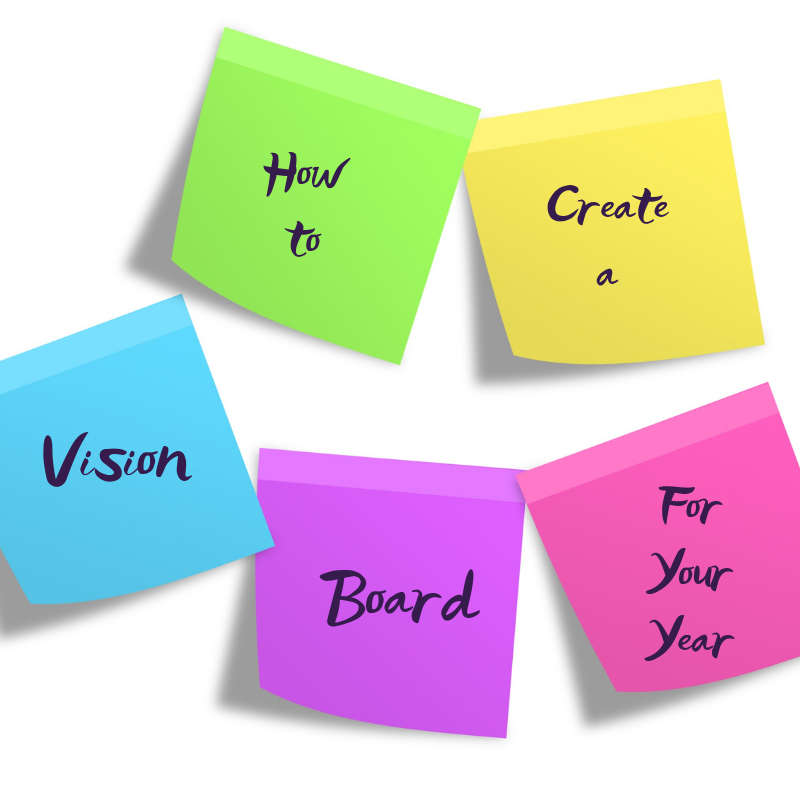 What would you like to create a vision board for? A couple of weeks ago, I shared with you my planner setup for 2019. Well, it’s 2019 and I know we’re only a day in, but I’m already loving my planner! But, as I was setting it up and my planner was getting thicker and thicker I realized something: I needed just a little separation. 2018 brought about a lot of new things here at Casa Knight: bebe started karate, which leads to several practices each week, RadioMan started a new job that not only includes sportscasting but also running a radio group (and all the meetings, late nights, and ballgames that entails), and I started working part-time outside the home. All of that means our family schedule is packed. It also means that, many times, our family schedule takes up space that I need to have dedicated to my writing…and when I don’t, some of the business parts of my writing can be put off or (gasp!) forgotten. Which is where Separation comes in. I decided to split out my writing from our family planning (although some of the same appointments go in both – because it never hurts to have some things in multiple places). 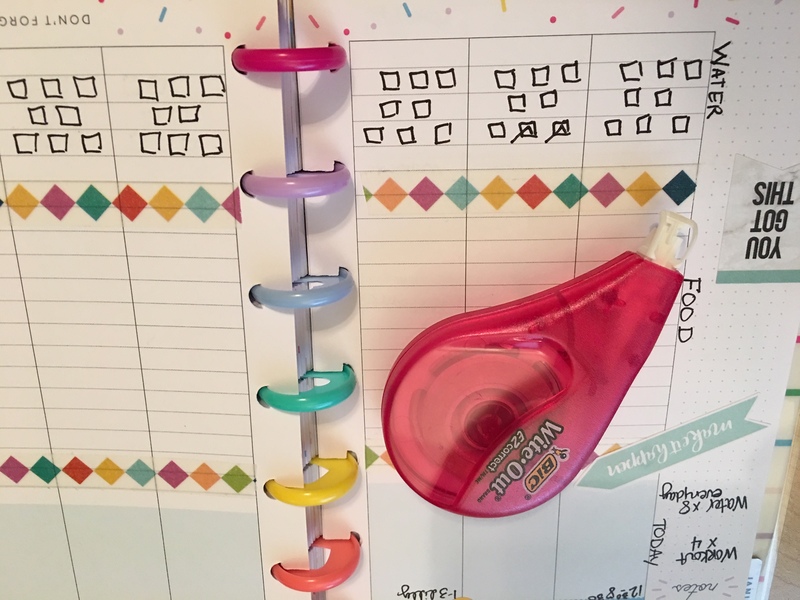 So, I bought my first Happy Planner Mini (this one, an hourly format) that I’m not using hourly but as a workout, food, and water log, along with appointments and family things. Begin tracking my food and water intake, along with workouts, in my mini planner. Health is going on the front burner this year because…well, because it needs to. And by health I do mean physical, but I’ll be doing some mental-health things, too. Stay tuned! Start writing my next full length project, with a goal of pitching by the end of January. In addition, continue working on my next contemporary series idea, this one with the goal of pitching mid-February. Begin working on plans for my book releasing in March, including a cover reveal and creating a dedicated page for it here on my website. If you’ve got a goal (or twelve) for January, feel free to share in the comments. I’d love to hear from you! I adore hot chocolate. Seriously. I’m not big on coffee, and I’m really particular about teas (and actually prefer them iced – I know, I’m a Philistine!) so when I go for a hot beverage more often than not it’s hot chocolate. Which I’m also particular about because there is a difference between hot cocoa (which is fine, but not my favorite) and hot chocolate (which, when made correctly, is divine). Since we’re into the cold months, I thought I’d share my grandmother’s hot chocolate recipe. Here we go! First things first, the chocolate needs to be melted so pop it into a microwave safe bowl and blast it in 45 second increments, stirring between each blast, in a microwave until it’s nicely melted. While you’re melting the chocolate, it’s safe to start on the milk. Using a sauce pan over medium heat, warm the vanilla and milk until it’s at the scalding phase – you’ll know it’s at the right heat when it’s 180 degrees…or, if you don’t have a handy thermometer, when there are bubbles around the edge but it isn’t boiling. If you make a mistake and the milk boils, my suggestion is to start over because that will give the drink a grainy texture. Turn the burner to the low setting and begin to add in the melted chocolate, stirring as you do. Once the chocolate and milk are well blended, pour into mugs, top with a bit of whipped cream (the kind from the can, not Cool Whip) and add in the peppermint if you’re in a mint-chocolate mood). Serve. A couple of notes: This makes about four servings, depending on the size of your mugs, which probably means leftovers. Yay! And, yes, you can keep this for a bit by storing whatever is left in a covered dish/mug in your fridge for up to three days. Reheat over the stove as reheating in the microwave can lead to uneven temperatures and a drink that isn’t as smooth as the original. Also: I do mean use dark chocolate (some call it bittersweet), this recipe won’t be the same (it will still be fine, but not as good in my opinion) if you use either semi-sweet or milk chocolate…if you do use either of those definitely nix the added sugar, as it won’t be needed. I keep chocolate chips on-hand in my house, Nestle’s Dark are my favorite for this recipe. 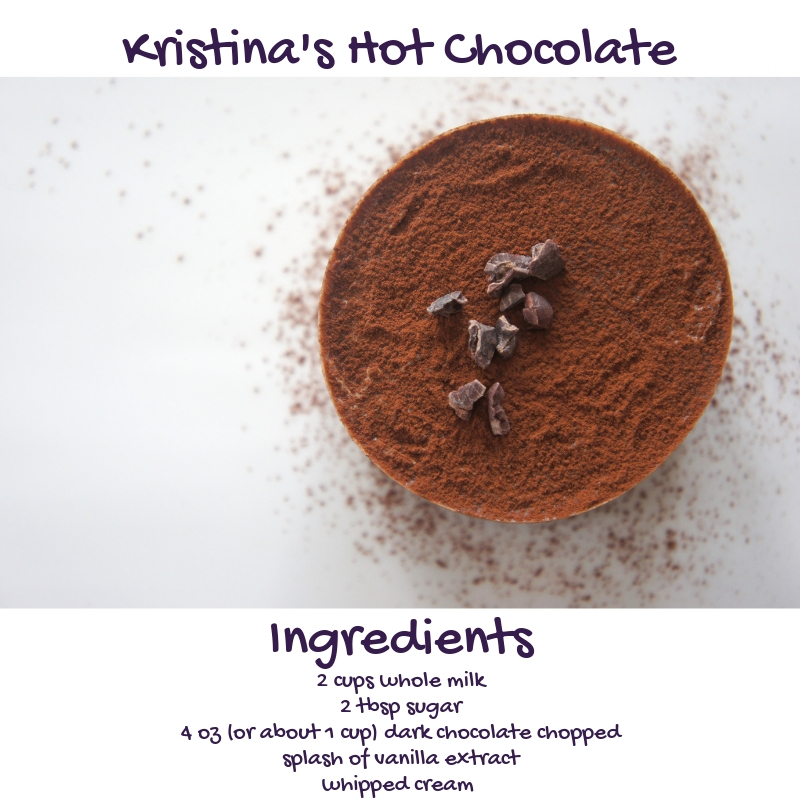 There you have it – the perfect (in my opinion) hot chocolate! Do you have a favorite cold weather hot beverage? Feel free to share! I love this time of year, from the decorations and the music to the parties and the food. What I love most, though, is that I get to start planning for new adventures, new books, new career plans. It’s scary, but it’s also really invigorating. And, because I’m starting to get things together for 2019, I thought I’d show you guys my planner set up for the new year. First, the basics: what I’m using! 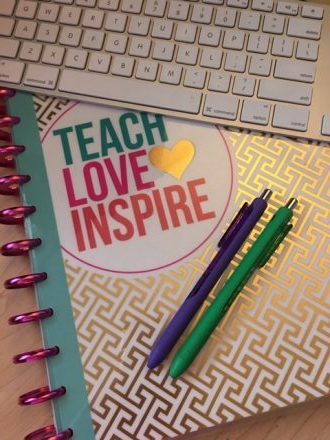 I’ve been a fan of The Happy Planner for a few years now. I didn’t think I’d like the disc format at first, because I didn’t realize how sturdy those little discs are. I have yet to lose a page from my planner even though I lug it around everywhere. I also really like the flexibility of it – want to add a page? It’s as simple as using a disc punch, and without pinching your fingers in binder rings. Want all your monthly layouts at the front? Put them all there. Want to divide your year on a quarterly basis (that’s what I do)? It’s as easy as adding in your goal pages and inserting a divider or two. 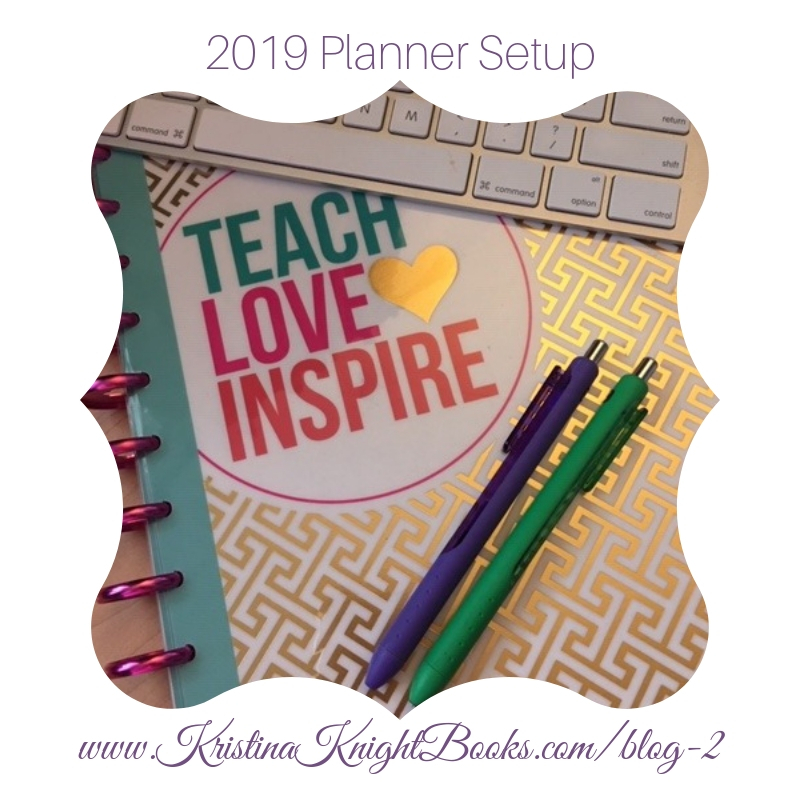 This year, I’m changing one thing about my planner set-up – I’m going with a Teacher Edition from The Happy Planner line. Putting a blank box sticker on the left where Happy Planner puts the Monday-Friday days of the week. Those boxes will now be my time blocks for different projects (literal projects like the contemporary and WF books I’m currently writing) and tasks (like social media, home stuff, bebe’s schedule). Then, I write the Monday-Sunday days of the week at the top of each page. I’m doing this because I like to plan through the weekend. If you don’t, you wouldn’t have to do that hack. The Teacher Planner runs August-July, not January-December. To fix that, I’m simply putting the July-December monthlies in the back of the planner, where they belong, and I’ll redate them as I need to. Sounds like a lot of work? It really isn’t, especially since I’m already re-dating the weekly pages to be Monday-Sunday. Second, my planner set-up. I mentioned that I plan quarterly. That means I add quarterly goal sheets to my planner in January, April, July, and October. On these pages I list any deadlines I have, both for drafting and editing. 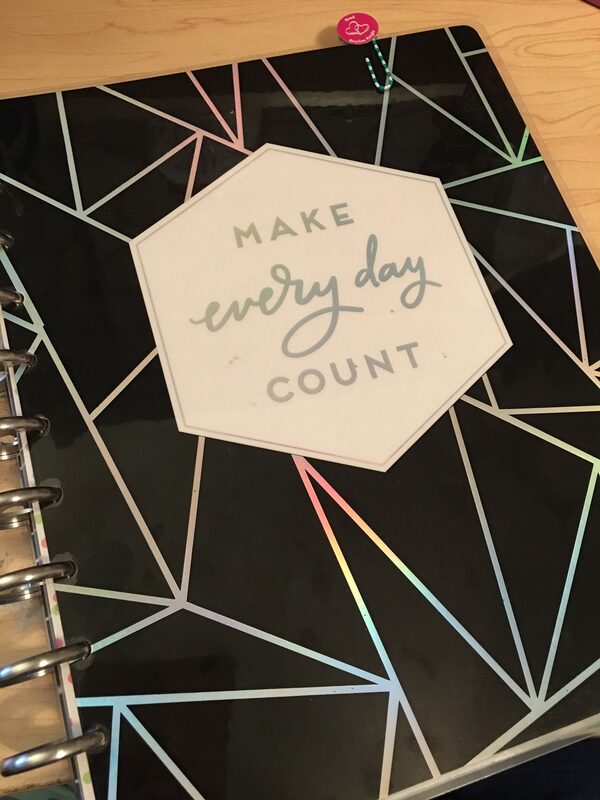 I also list weekly and monthly wordcount goals, along with plans for my business as a whole. I’ll also block out vacations, snow days and “add in” time off for things like sick days. 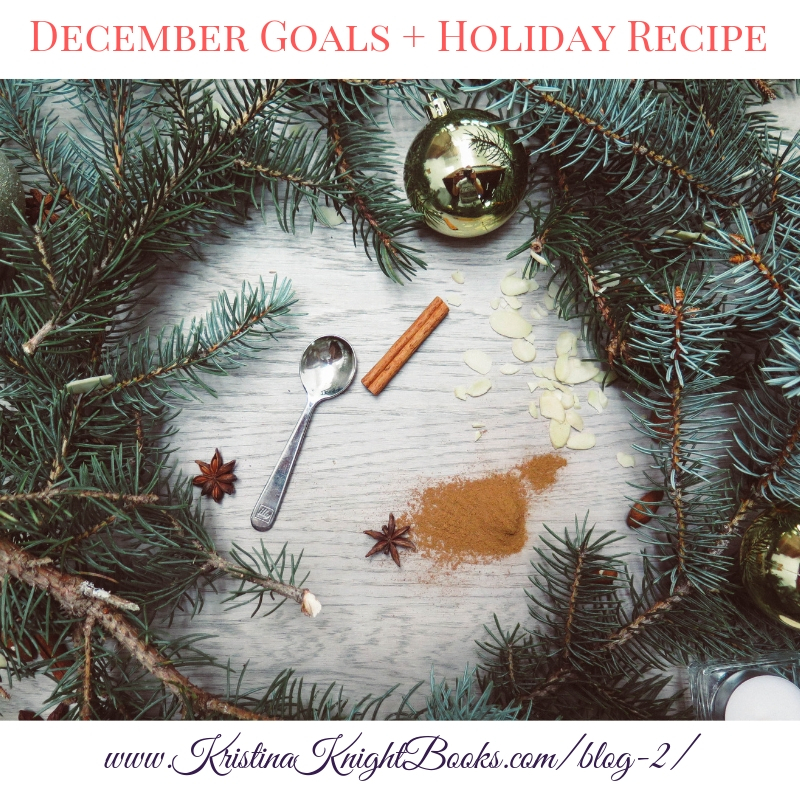 My quarterly plans might include goals for backlist promotion, new books, social media/follower goals, goals for this blog and my other social channels. This keeps the “big picture” in one place where I can track how I’m doing. I also use Monthly Goal pages. Like the quarterly, the monthly helps me break down my writing goals, my social media/marketing goals, and other tasks that I need to accomplish. 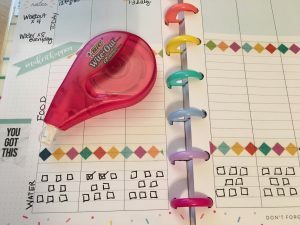 I also have a space (you can see it on the left side of the page) where I have three habit trackers – one for writing, one for health (exercise, water intake) and one for “me” time…because self-care is HUGELY important. Seems like too much planning? Maybe, but it works for me. What I like about this kind of planning is that it helps me see not only the big picture for the quarter but what I need to accomplish each month (and week, using the weekly pages) to meet those bigger goals. It also helps me be more realistic because it’s already accounting for time off for things like vacation or when bebe is sick (or RadioMan or me, for that matter). If you’d like to give these pages a try, they’re available – and free! – over on my Printables Page. What about you? 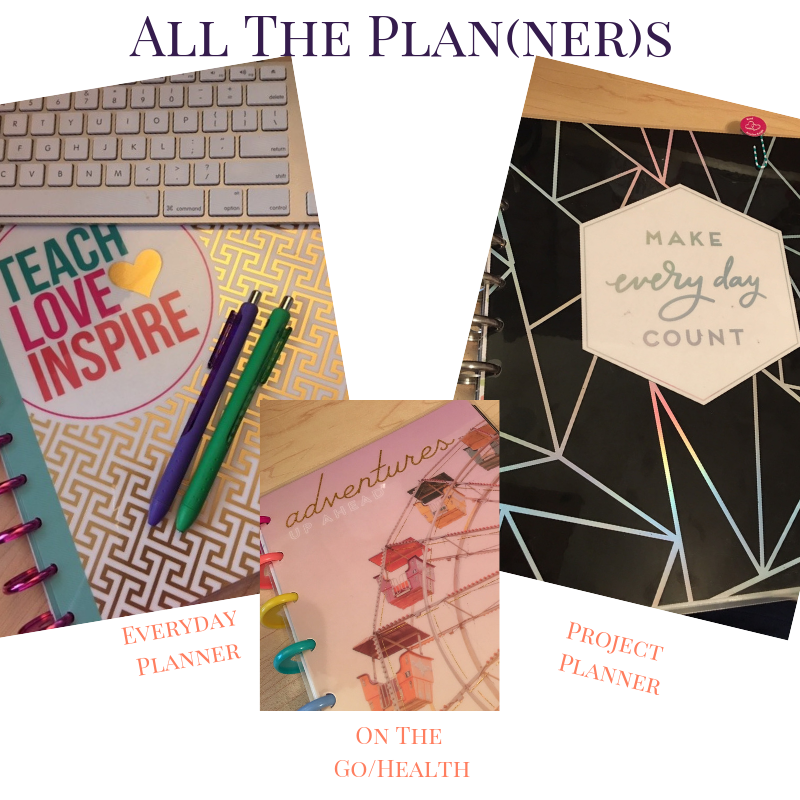 Do you have a planner system you love or have big plans for the new year? Share in the comments, I’d love to hear from you! The calendar has rolled around again – and it’s time for a goals check-in! Here we go. In November, my personal goals were to track meals and workouts Monday-Friday, to continue using time-blocking techniques in my daily schedule. These two goals both get a tic beside them because I succeeded in meal-tracking and time-blocking in November – and I’ve felt so good! Work goals: finish and format the novella that is coming out in March: the novella is finished (tic!) but I need to tweak a little bit on the formatting, along with making a couple of more editing changes before it’s 100% finalized (partial-tic). All in all, I’m happy with my progress, which will make December goal-setting a bit simpler. Set a daily writing goal on Sunday of each week (Sunday is my planning day); my minimum writing goal will be 1,000 words. Finalize a partial/synopsis for my agent. Finalize the novella edits and formatting in preparation for the March release (I just saw the cover and I canNOT wait to share with you guys!). That’s it. It sounds like December will be a simple month, but with holiday parties and family trips and last-minute baking and shopping, Speaking of holiday parties and baking, I’ve got a fun recipe to share with you guys today! 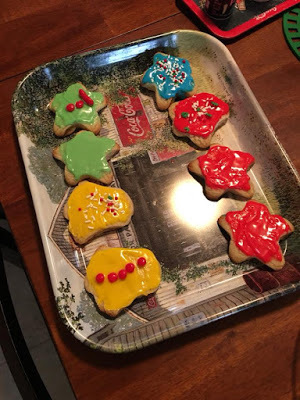 It’s my mom’s sugar cookie recipe, along with my sugar cookie icing recipe. We always take a couple of Saturdays in late November/early December to bake and ice and then we freeze the resulting cookies so that starting on December 23, we just have to grab a tin of cookies from the freezer when we’re ready to munch. Here we go with the recipe! Put the butter and sugar in a large mixing bowl and cream them together until smooth; beat in the eggs and vanilla, again until smooth. Next, add in the flour, baking powder, and salt. Now cover the bowl and put it in the fridge, you’re going to chill this mixture overnight. The next morning (or afternoon), preheat your oven to 400 degrees F. Roll out your dough (finally! something to use that rolling pin Aunt Betty gave you at your wedding!) to about a half-inch thick. Use whatever cookie cutter shapes you like (we’re fans of stars, trees and balls because reindeer legs have a tendency to get too thin and burn…but you do you!). Cut out the shapes and place the cookies 1 inch apart on an ungreased cookie sheet. Back about 7 minutes and then let them cool completely. Ice the cookies (don’t worry, the icing recipe is below)! The most important piece of a sugar cookie (in my opinion) is the icing. Some are fans of buttercream, but I like a lighter icing. One that adds sweet, and maybe has the hint of a crunch, but that stays soft in the middle…that is exactly what this icing recipe does! Put the powdered sugar into a mixing bowl, add the milk, KARO syrup and vanilla and cream all of that together. You want the icing to be almost firm, not drippy, but it needs to spread easily. I always test it with a simple kitchen spoon — if I can hold a spoonful upside down without it dropping right off, the consistency is right. Once the icing is the firmness you want, divide into different bowls and add the colors of food coloring you want, mix and you’re ready to ice the cookies! I’m going to need a lot of focus. How about you? What are you planning and goal-setting for December? I am asked – often – how to deal with editor’s notes. 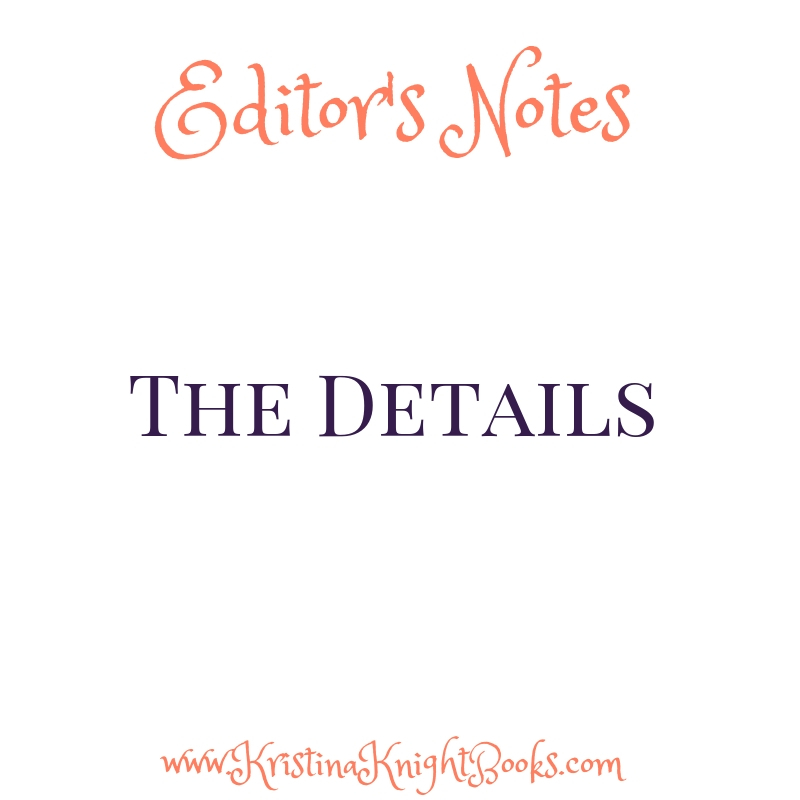 Whether they are big-picture, copyediting notes, or a mix of both. It’s a good question, especially because the first few times through an edit can be daunting. Do you change everything the editor asks about? Nothing? Somewhere in between? How do you know how Change A will impact the midpoint of the book? What about the Black Moment? I approach my editor feedback like a big girl. Usually I will read through the editing notes first. Then I’ll read through the MS and all the comments which takes me about a day. I take a day to digest it. After that, if something still doesn’t ring true to me, I’ll make my own note in the comments next to hers. I’ll try to explain, for instance, why my hero has been deeply affected by such and such. Or I’ll explain why this or that makes sense to my heroine. Occasionally, if I’m confused by a comment, though I’m always able to email and ask, I find I usually “get it” a day later. Most of the time, my editor’s notes are spot-on! Maybe I’m lucky, I don’t know. But they always seem to pinpoint those areas where I know I need to dig deeper. Why does this matter? Why does my character care so deeply about it? Or in the instance of my latest proposal, when my editor said: this ending doesn’t work for me! To be honest, it didn’t work for me either, so it was just confirmation I needed to re-work that ending. My Harlequin editors are wonderful. They never try to squelch my voice. They just want to make sure I’ve gone as deep as I can and they’re right most of the time. After the initial feeling of overwhelm, I try to remember what my editor says, “Sometimes you just need to change or add a sentence or two, or even just a word or two. Turns out with the latest WIP, I ended up adding an entire chapter and an epilogue, but it did make the book better, no question. I always find feedback a little bit terrifying. So as soon as I get it, I read through it once, then put it away. I’ll then spend a day or two just sort of processing the general ideas included in the feedback. Once I get used to them, I’ll go back through the feedback in detail and make notes about how I plan to address it. from the story, and that their feedback will make my story stronger. I think it’s important to let go of my ego and really take their advice with an open mind and heart. I’m saying this because I have met authors who seem very suspicious of feedback and don’t seem to want to take it. I would offer this advice. If you don’t agree with the editor or agent’s specific suggestions, try to think about what they are saying in general. I recently had an experience where the editor wanted me to strengthen the conflict, but her ideas about how to do that just weren’t resonating with me. They were good ideas, but they didn’t speak tomy heart. It took a few days of thinking really, really hard, but then I had a big ‘aha’ moment. I changed the entire backstory of my hero and heroine and upped the conflict significantly, in a way that satisfied both the editor and me. Here’s where I’m a Weird Person. I love the feedback even when I hate it, because then I know what he wants rather than guessing at it. If I’m hoping to sell the story, I have to be willing to share ownership of it. This isn’t always easy, and I’ve made changes that to this day I think were mistakes. However, at the end of the day, he’s the editor and I’m not, and the publisher still signs my checks. There you have it, friends, a few new ways you can approach editor feedback – to make your book the best it can be. If you have another tip, share in the comments! I can’t quite believe Thanksgiving hits this week here in the US. It’s early this year, which is part of it, but also it just doesn’t seem like it should be Thanksgiving. It doesn’t feel like we should be this close to 2019 or Christmas or…any of it! But I’m still really excited about the holiday – seeing our extended families, relaxing over movies and games and old stories that really don’t need to be told again. And, I’ll be doing a little writing. Which brings me to my point: the holidays can and will get stressful from time to time, no matter how hard you try to keep the stress at bay. Here are a few tips to get through the season with as little stress as possible. First, set designated working time. It can be tempting to go have breakfast or head outside with the kiddos first thing in the morning. The problem with that is that those few minutes have a tendency to turn into a whole morning and then more activities in the afternoon and pretty soon your stressing out because you haven’t done any of the work you’d planned. Setting aside an hour or so each morning will help you meet your goals – for work and for family time! Second, disconnect. It can be tempting to check social media or email just one more time. Don’t do it. Put your phone or tablet in another room during family time so you can soak in those moments with your kids, nieces, and nephews! Third, get outside. Sure, it’s cold in a lot of areas. Embrace the season by getting outside. Take a walk or a hike with the kids, play football with your cousins, aunts, and uncles. Drink hot cocoa and wear layers and mittens and cute boots. We sit at our computers all the time, and that puts stress on our bodies. Getting up, getting outside helps to relieve those desk-stresses – and might also spark a few new ideas. What about you? Do you have any tips for relieving stress during the holidays? Hi! 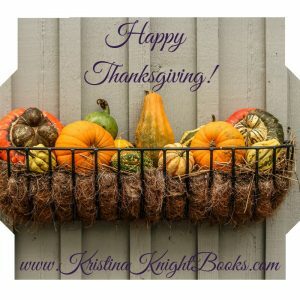 I’m Kristina Knight, author of sassy contemporary romances that have appeared on Kindle Bestseller lists. I love hearing from readers, so drop me an email!